Mariah studied music at UC Santa Cruz, where she worked with Mickey Hart of the Grateful Dead and ethnomusicologist Fred Lieberman on the “Planet Drum” project. She’s also studied with jazz legend Art Lande and Latin jazz pianist extraordinaire Rebeca Mauléon, and she performs regularly with the innovative world music group Ancient Future. 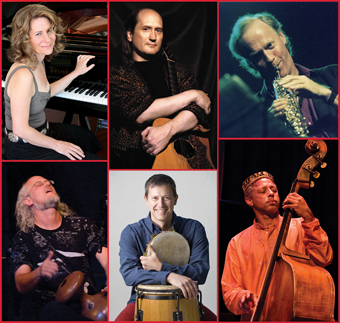 A gifted composer and a visionary band leader, she’s gathered together a remarkable ensemble. Grammy-winner Paul McCandless, of Oregon and Paul Winter Consort fame, plays woodwinds. Matthew Montfort of Ancient Future plays guitar. Kash Killion, who’s played with Cecil Taylor and with the Sun Ra Arkestra, doubles on bass and cello. Ian Dogole shares percussion duties with Brian Rice of Choro Famoso and Wake the Dead. Mariah plays piano and santur, an instrument similar to a hammered dulcimer that originated in Persia. For an evening of scintillating jazz, subtle and sensuous, exotic and inventive, catch Mariah Parker’s Indo Latin Jazz Ensemble at the Freight.